Kathleen graduated from UC Santa Barbara with a degree in microbiology with an emphasis in genetic engineering. Once she was exposed to dentistry, she knew that she had found her niche. In 1993, she graduated with honors from the UCLA School of Dentistry. She was the recipient of multiple awards during her educational experience at UCLA. She received the Academy of General Dentistry award given to the senior student who showed the most promise of being an outstanding general dentist, the Mobile Clinic award for her four year commitment to providing volunteer dental services to those in need, and she was accepted to the Omicron Kappa Upsilon National Dental Honor Society. Dr. Bennett continued her dental education by attending a 1-year general practice residency at the Long beach VA Hospital to gain additional training. 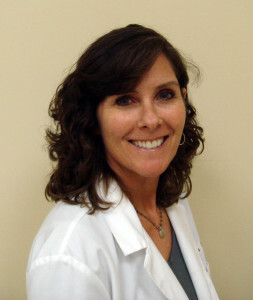 At the beginning of her career, Kathleen taught in the fixed prosthodontics department at UCLA. She taught both pre-clinical and clinical dental students for over five years. She has been working in private practice since 1994 and has worked locally in Agoura Hills and now Westlake Village the past eighteen years. Kathleen truly loves everything about family practice, as she enjoys seeing both children and adults. Outside of her work, Kathleen’s passion is her family. She met her husband when she was eighteen years old at UCSB. Kathleen, her husband Dan, and their daughters, Sydney and Kailey, love being in the great outdoors. They enjoy camping, hiking, paddle boarding, doing marathons and all sports in general. They share their home with 4 pets, a French Bulldog , two cats, and a dwarf hamster named Bugaboo.